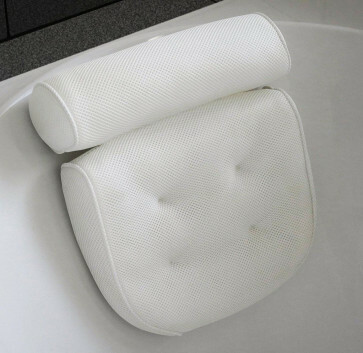 The Orthologics Large Bath Pillow cushion brings new heights of unparalleled comfort and relaxation to your bathroom Spa experience, Made from specially designed molded waterproof foam, the Bath pillow provide ergonomic support to your back and neck area. The Bath Pillow features 4 rear suction cups and and which effortlessly attaches to the tub, position it low or high depending on your preference. The soft foam protects and relaxes the back and neck area from the hard ceramic tub surface which can distract from your relaxing Spa experience. The back rest helps aid proper alignment and relaxes your back muscles to put you at ease The Pillow is fully waterproof and self cleaning and also has a waterproof washable net cover. The foam is specailly designed from a purpose made sponge design which allows it to dry extremely quickly. Extremely comfortable to use, a Must try for all bath lovers!